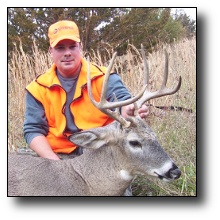 We had scouted this farm a few years before, and liked it , but never got the opportunity to hunt the farm. Me and my dad went in August to look it over again. Then we found out that we got it for rifle season. I picked a nice spot on a hill overlooking an overgrown CRP field. It was opening day. I had 3 does come through earlier in the morning, but no bucks showed. For the last couple of years I started rifle hunting on the ground out of my turkey blind. This makes a much more pleasant hunt with my comfy camp chair, because I normally hunt from daylight till dark during the rifle season. This worked perfectly on this hunt. I realized that when the neighbors are headed back to their truck for coffee, that is when I see most of my deer. So I was ready when my buck came through around 12:30 in the afternoon. I used my trusty 30-06, and a 70 yard shot through the shoulders put him down quickly. 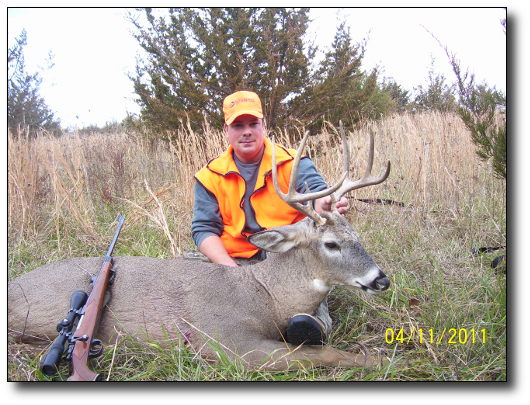 My dad, (also a member) has been deer hunting for over 50 years. It is special when we can bring a nice buck home. He still get just as excited as I did, when he took me on my first hunts 20 years ago.